Cooking lavender in various packs. Coming from the lavender fields of Provence, our dried lavender is high in essential oils, producing a highly fragrant flower. Cooking lavender can be used to flavour shortcake, icecream and other foods. Just sprinkle a teaspoon or more into your favourite recipe, or make an infusion which can be used in cooking. See link to blog post right for more info. Please note - this is the only item we sell that is recommended for food use! 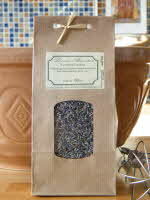 Fragrant cooking dried lavender from France, packed in a window bag containing 60g. The same cooking lavender as above in a galvanised metal gift tin. Red, pink, ivory and burgundy available in a selection of weights. A wide selection of ready made pot pourri including lavender fragrance. A selection of weights and colours. To buy our cooking lavender, just click on the enter shop links above which take you to our online shop (www.daisyshop.co.uk) where you can browse our range and pay securely. Back to top of cooking lavender page. FREE download of Lavender Craft!